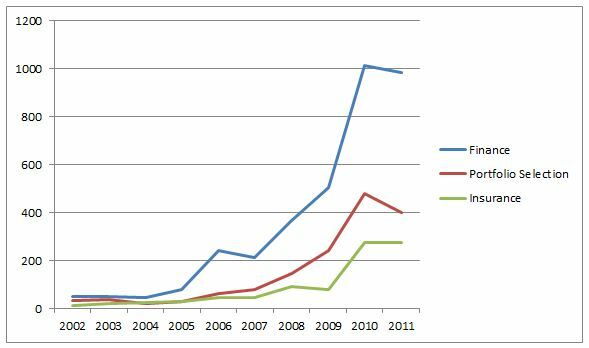 The Patent Office continues to issue patents for financial services inventions at much higher rates than in the past. The last two years have seen an especially sharp increase in the number of financial-services related patents issued. For example, patents in classification 705/4, which is titled “Insurance” have increased from a rate of about 25 per year over the first five years of the decade to a rate of about 275 patents per year during 2010 and 2011. Similarly, patents in the classification 705/36R, which relates to “Portfolio Selection” have risen from an annual rate of about 35 per year at the beginning of the decade to an average of 440 per year over the last two years. The “Finance” classification (705/35) has seen a twenty-fold rise from about 50 per year to about 1000. 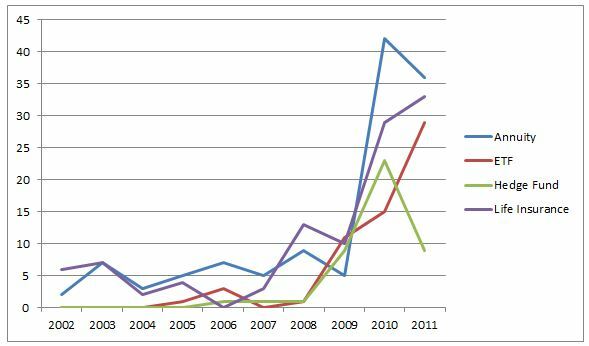 The graph below shows the number of patents issued in these classes for the years 2002 to 2011. The numbers of applications published in each of these classifications has increased only gradually over the decade, and cannot account for the recent uptick in issued patents. Some of this uptick is undoubtedly due to the Patent Office working through a backlog of filings under new new Director David Kappos. However, it also seems likely to be the result of an increase in the allowance rate. Whatever the reason, patents for financial services inventions are being issued at rates several times what they were during the early 2000s. For a brief period after the Federal Circuit decision in Bilski, and after some negative non-binding comments by the Supreme Court, it looked as though patents related to financial services might be an endangered species. However, the last two years have represented a significant proliferation of such animals. Insurance companies and other financial services companies will do well to imitate “hard” industries by monitoring their own innovations for possible patentable inventions, and by performing freedom to operate searches before implementing new products in order to avoid patents owned by third parties. Lincoln National Life Insurance Company (a member of the Lincoln Financial Group) owns patents related to the administration of variable annuities that have guaranteed withdrawal benefit riders. Lincoln has asserted these patents against several companies, including filing several lawsuits. One of the lawsuits, against Transamerica Life Insurance Company, went to trial and resulted in a verdict that found Transamerica had infringed one of the patents and ordered Transamerica to pay damages of over $13M. That verdict was overturned on appeal. The patent requires making scheduled withdrawal payments to an annuity owner using a computer, even if the account value is exhausted. The undisputed evidence at trial was that no account values for Transamerica’s annuity owners had yet been exhausted, and Transamerica had not built out the computer modules necessary to administer payments if the account value was exhausted. In other words, if the payments ever became necessary, it was possible–at least in theory–that Transamerica could administer the payments by hand. Therefore, the appellate court found that Transamerica had not infringed the patent. Thus a hole in the patent was revealed. In a new patent issued last week (US Patent No. 8095398), Lincoln has attempted to plug the hole. Claim 1 of the new patent is nearly identical to the claim at issue in the litigation, except that new claim 1 specifies that the step of making scheduled payments even if the account value is exhausted “can be made without the aid of a computer.” If Lincoln asserts this new patent against Transamerica, or any other insurance company, the accused infringer will not be able rely on administering the payments by hand, rather than with the aid of a computer, to establish that they are not infringing the patent. The new patent was the result of a “continuation application.” A continuation application is a patent application that uses the same disclosure as an earlier application, but has different claims. Any continuation applications must be filed while the earlier application is still pending. However, there is no limit to the number of continuations that can be daisy-chained together. Therefore, it can be a valuable strategy to file a continuation application with amended claims each time the issue fee is paid for an allowed application. Keeping a continuation application alive gives the patent owner the ability to address any weaknesses in the original patent that may be identified during litigation. It remains to be seen whether Lincoln will aggressively pursue enforcement of this new patent. Lincoln may be reluctant to sign on for additional litigation after going through the time and expense of the first litigation only to come away empty handed. However, this case does illustrate both the value of continuation applications and the risk of claiming a computer implemented method. The recently-approved Leahy-Smith America Invents Act includes expanded procedures for challenging patents administratively, rather than through the courts. One of the new vehicles for challenging an issued patent is called “post-grant review.” This new post-grant review procedure will apply to patents having a priority date later than March 13, 2013. Additionally, the Act creates a sort of super post-grant review for some business method patents that goes into effect September 13, 2012. Post-grant review permits any person who is not the patent owner to initiate a review of the patent to determine if any of its claims should be cancelled as being unpatentable. Unlike current reexamination proceedings, the new post-grant review is not limited to invalidity based on printed prior art. Any ground that supports unpatentability, including failure to satisfy § 101, lack of written description, or prior sales or public use, can be used to cancel claims in a post-grant review proceeding. A post-grant review must be initiated within nine months of the issuance of the patent. After the nine-month deadline, a person wishing to administratively challenge the patent will need to rely on the more limited inter partes review or ex parte reexamination. In particular, after the nine-month deadline, administrative challenges will be limited to printed publications as prior art. A significant detriment to using the post-grant review is that the party initiating the post-grant review will be estopped from raising any ground that was or reasonably could have been raised in the post-grant review. Therefore, potential defendants will severely limit their ability to defend against a patent infringement charge if the post-grant review is not successful. This new post-grant review procedure will only apply to patents that are subject to the new first-to-file prior art standard. The new first-to-file standard only applies to patents with a priority date later than March 16, 2013. Therefore, this option will not be available for use until patents filed after March 16, 2013 start issuing. The new Act includes a special “transitional program” for business method patents. This transitional program permits post-grant review of business method patents, without some of the less attractive features of the post-grant review as applied to other patents. Furthermore, the person challenging the covered business method patent must have been sued for infringement or have been charged with infringement under the patent. There may be some ambiguity as to what the Act means by “charged with infringement.” Most likely it will require at least some sort of assertion by the patent owner that the party initiating the proceeding has infringed the patent. The transitional program includes the same benefits as post-grant review in that the challenger may raise any ground that would make a claim unpatentable. However, the estoppel that results from an unfavorable final ruling only applies to the grounds actually raised in the proceeding, and does not extend to issues that could have been, but were not raised. That is a significant advantage for potential defendants who can reserve many of their defenses for the judicial proceedings. The transitional program for business method patents is not limited to patents covered by the new prior art rules, and may be used on any patent, even patents issued before the effective date of the Act. Additionally, the nine-month time limit for initiating the proceeding does not apply to covered business method patents. One wrinkle is that if post-grant review is available, the transitional proceeding may not be used. Therefore, after the post-grant review provisions take effect (e.g., on patents that have an effective filing date after March 13, 2013), a person who wishes to challenge a covered business method patent may wish to wait until more than nine-months after the issuance of the patent and file under the transitional program in order to get the beneficial estoppel rules. The Patent Office should make the transitional program for business method patents available beginning September 13, 2012. The Act includes a sunset provision that eliminates the transitional program eight years after it goes into effect. The standard post-grant review and the transitional post-grant review of business method patents procedures are new tools that will permit the administrative challenge of patents. The special provisions related to business method patents, especially the limited scope of the estoppel, may make that option attractive for those that have been accused of infringing financial services related patents. The post-grant review procedure will require close watching of issued patents as they are published in order to avoid missing the nine-month filing deadline. The recently approved Leahy-Smith America Invents Act includes several significant changes that relate to financial patents. According to one of the new provisions, “tax strategies” are not eligible for patent protection. A “tax strategy” is defined as any strategy for reducing, avoiding, or deferring tax liability. However, the law has a carve out that specifically permits patents related to technology that is used solely for preparing a tax return, or technology used solely for financial management, as long as it does not limit the use of any tax strategy by a taxpayer. More specifically, tax strategies are treated as though they are in the prior art. Therefore, any attempt to obtain a patent on a tax strategy will require novel and not obvious features apart from the tax strategy itself. For example, a new way to visualize various tax liabilities might be patentable, whereas the strategies for reducing taxes that are suggested by the visualizations would not be patent eligible. The law applies to all patents issued after September 16, 2011, and to all pending and new applications. Tax strategy patents issued before September 16, 2011 are not affected by the new law. The Patent Office and courts have not had much opportunity to apply the new law. The most interesting areas will relate to retirement savings products, which often include as a component the ability to defer tax liability. Going forward, new applicants will definitely want to make sure the invention is presented as including technology apart from the mere ability to avoid, reduce, or defer paying taxes. As a practical matter this may require additional disclosure and claim limitations relating to the computer systems used to implement the invention and the structures used to communicate or display the results. Yesterday, the Federal Circuit affirmed a finding by the District Court for the Northern District of California that claims directed to a system and method of detecting credit card fraud were invalid because they were directed to an abstract idea. The case is Cybersource Corporation v. Retail Decisions, Inc.. The first claim the court looked at was for “a method of verifying the validity of a credit card transaction over the Internet.” The claim did not explicitly recite any hardware for performing the steps of the method. However, it did recite “constructing a map of credit card numbers.” The court reasoned that because all of the recited steps could be done either in a human mind, or by a human using a pen and paper, they were merely mental steps. Therefore, the claim as a whole is directed to an abstract idea and is not patentable under 35 U.S.C. §101. Regardless of statutory category (“process, machine, manufacture, or composition of matter,” 35 U.S.C. § 101) a claim’s language is crafted to literally invoke, we look to the underlying invention to patent-eligibility purposes. Here, it is clear that the invention underlying both claims is a method for detecting credit card fraud, not a manufacture for storing computer-readable information. In particular, the court put the burden on the patent holder to “demonstrate that the claims are truly drawn to a specific apparatus distinct from other apparatuses capable of performing the identical functions.” Because the patent owner could not meet that burden, the court analyzed the Beuaregard claim as a process claim. It again found it to be directed to an abstract idea because all of the recited functions were capable of being performed mentally (or with a pen and paper). Therefore, the case on its face appears to create a “pen and paper” rule that treats steps that can be performed using a pen and paper as merely mental steps. It also places the burden on the patentee to show that any Beauregard claims are drawn to a specific apparatus distinct from other apparatuses capable of performing the recited functions. The logic of the decision is difficult to follow. How are patent applicants and the public at large supposed to determine what the underlying invention is apart from the literal claim language? I always thought the claim defined the invention, not vice versa. The court also does not satisfactorily explain why using pen and paper, which is completely physical and external from the body, is a mental step. This case has real potential to cause confusion in the Patent Office and in the courts. To establish infringement of a method claim, a patent holder must show that all of the recited steps in the claim are performed by a defendant. If the recited steps are not performed by a single entity, but by the defendant acting in concert with another party, the patent holder may still show “joint infringement” if the defendant controls or directs the activities of another party. The joint infringement issue can be especially important in financial services method patents. In Akamai Technologies v. Limelight Networks the Federal Circuit looked at what types of activities qualify as directing or controlling the activity of a another party. The court opted for a bright-line rule that requires either a principal-agent relationship or a contractual obligation to perform the steps of the claim. The patent in question relates to a method of delivering large amounts of Internet content without crashing or bogging down. In particular, a hosting service hosts embedded objects (such as pictures, videos, graphics and the like) that are embedded in a website. Therefore, a webpage owner might use the services of a hosting service to host the embedded objects within their webpage. Most of the steps of the asserted patent claims are clearly performed by the hosting service. However, one of the recited steps is to tag the embedded objects so that they direct a visitor’s browser to the hosting site to retrieve the embedded objects. The tagging step is generally performed by the webpage owner. In this case, the defendant Limelight Networks ran a hosting service. It was undisputed that Limelight did not itself tag the embedded objects as required by the claims. However, the patent holder alleged that Limelight was liable under the joint infringement theory because Limelight controlled and directed the tagging step. Specifically, Limelight gave detailed instructions to the webpage owners on how to perform the tagging step and had a standard contract with the webpage owners that required the webpage owners to perform the tagging step if they wanted to utilize the hosting services. The Federal Circuit first announced its bright-line rule that joint infringement only occurs when there is a principal-agent relationship or a contractual obligation to perform the steps. In applying the rule, it stated that the test of a principal-agent relationship is whether “both parties . . . consent that the agent is acting on the principal’s behalf and subject to the principal’s control.” The detailed instructions on how to use the services were not enough to create a principal-agent relationship. Furthermore, the standard contract between Limelight and the webpage owners using its hosting services did not obligate the webpage owners to perform the tagging step. The webpage owners needed to perform the tagging step if they wanted to use the hosting services for a particular embedded item, but they were not obligated to perform the step. Therefore, the court found no joint infringement. The important takeaway from this case for inventors is to try to draft claims that will be infringed by a single entity. For example, in the Akamai case, rather than reciting the step of tagging an embedded object, the claim could have been drafted to include the step of receiving a request initiated by tagged embedded content. For possible defendants, it may be worthwhile to investigate whether it is possible to outsource some of the steps of an otherwise patented process to a third party in a fashion that avoids joint infringement. In a second important case interpreting §101 in the last two weeks, the Federal Circuit on Friday looked at the issue of what constitutes an attempt to patent a natural phenomenon. In Prometheus Laboratories, Inc. v. Mayo Collaborative Services, the Federal Circuit determined that a method for optimizing the dosage of a medication was appropriate subject matter within the meaning of § 101. The broadest claim recites basically a single step: (1) determining the level of a specific factor (6-TG) in a patient that is receiving a particular medication, wherein if the determined level is less than a first level that indicates a need to increase the dosage of the medication and wherein if the level is greater than a second level that indicates a need to decrease the dosage of the medication. Defendant Mayo argued that even if the tests on the samples are transformative, they are merely insubstantial data gathering, which has generally been held as insufficient to bring an otherwise unpatentable claim within the purview of § 101. In particular, Mayo relied on the case In re Grams, 888 F.2d 835 (Fed. Cir. 1989). In Grams the claims recited a two-step process of performing a clinical test on an individual and based on the data from that test determining if an abnormality exists. In Grams the Federal Circuit determined that the invention was not patentable because it was merely an algorithm combined with data gathering. The court distinguished Prometheus from Grams because the determining step in Prometheus is not “merely” data gathering, but is an important part of a treatment regime. In Grams there was no limit on what the clinical test could be, but in Prometheus it was limited to a test for a specific factor in blood. The court noted that the “wherein” clauses in the claims were mental steps that were not themselves patent eligible. However, because they were tied to patent-eligible subject matter, their presence in the claims did not disqualify the claims. One important question that appears to have been left open is whether satisfying the machine-or-transformation test is sufficient to establish that an invention falls within the eligible subject matter of § 101. The court recognized that Mayo made the argument that while it is not necessary for an invention to satisfy the machine-or-transformation test it is sufficient. However, in presenting its analysis, it only said: “as applied to the present claims, the ‘useful and important clue, an investigative tool,’ leads to a clear and compelling conclusion, viz., that the present claims pass muster under § 101.” It did not say whether there were circumstances where an invention could satisfy the machine-or-transformation test and still fall outside § 101. There are a couple important take-aways from this case for financial patents. One, the machine-or-transformation test continues to play an important role in determining whether purported inventions are directed to patent-eligible subject matter. New applications should be drafted with this in mind. Existing patents satisfy the test will almost certainly satisfy § 101. Two, the “transformation” prong of the test now appears to have importance. The court read the claims in a favorable way to find transformation. The “determining” step did not specify any particular physical test, or even that a physical test was necessary. Nevertheless, the court reasoned that a physically transforming test was necessary to make the determination . This raises the question my mind of whether transforming data with a computer, which necessarily involves a physical change to a storage medium, also satisfies the machine-or-transformation test. The big issues still waiting for Federal Circuit guidance from a financial patents perspective are: (1) When does performing steps with a computer tie a method to a particular machine? and (2) Is transforming data with a computer a transformation within the meaning of the machine-or-transformation test? The Federal Circuit recently revisited the issue of patentable subject matter under § 101 in light of the Supreme Court’s Bilski decision. In Research Corporation Technologies, Inc. v. Microsoft Corporation, the Federal Circuit determined that RCT’s claimed methods relating to half-toning digital images were not abstract and satisfied the requirements of § 101. This appears to be a very patent-friendly decision. It eschews the machine-or-transformation test, and instead requires that a claim be manifestly abstract before it is determined to be an exception to the broad categories identified by § 101. The Federal Circuit did not utilize the machine-or-transformation test. Instead its methodology was to first look at whether the claimed invention nominally fell within the scope of § 101. Since the claim recites a “method” and method is included within the definition of “process,” the claim facially falls within the subject matter of § 101. The Federal Circuit then looked to see whether despite nominally satisfying § 101, the claims were nonetheless excluded from § 101 by one of the three exceptions identified by the Supreme Court Bilski decision: laws of nature, natural phenomena, and abstract ideas. [T]he court will not presume to define “abstract” beyond the recognition that this disqualifying characteristic should exhibit itself so manifestly as to override the broad statutory categories of eligible subject matter and the statutory context that directs primary attention on the patentability criteria of the rest of the Patent Act. The Patent and Trademark Office sent a memorandum to the Patent Examining Corps providing interim guidance on how to examine applications in light of the Supreme Court’s Bilski decision. Basically the memorandum directs that the Examiners should continue to apply the machine-or-transformation test. If the claims satisfy that test they likely satisfy § 101. If the claims fail the test, the Examiner should issue a rejection and put the burden on the applicant to show why the claims are not directed to an abstract idea. Examiners should continue to examine patent applications for compliance with section 101 using the existing guidance concerning the machine-or-transformation test as a tool for determining whether the claimed invention is a process under section 101. If a claimed method meets the machine-or-transformation test, the method is likely patent-eligible under section 101 unless there is a clear indication that the method is directed to an abstract idea. If a claimed method does not meet the machine-or-transformation test, the examiner should reject the claim under section 101 unless there is a clear indication that the method is not directed to an abstract idea. If a claim is rejected under section 101 on the basis that it is drawn to an abstract idea, the applicant then has the opportunity to explain why the claimed method is not drawn to an abstract idea. Therefore, at least within the Patent Office, the primary test for whether claims satisfy § 101 will remain the machine-or-transformation test.